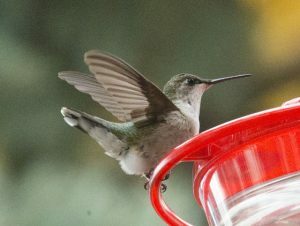 Below are some preliminary thoughts on the interesting female Archilochus hummingbird that is showing up at a feeder in Constance Bay, Ontario: http://birding.aba.org/message.php?mesid=1195334&MLID=ON&MLNM=Ontario. I believe I’m seeing some buff tips to the tertials and primary coverts, as well as faint tipping to the upperparts and the throat is very faintly flecked; if these observations are accurate, this indicates an immature bird. Figure 1: In this photo, note the shape of the inner primaries. On Black-chinned, the inner primaries are broad with weak tapering; these same feathers also lack notches along the inner webs. On Ruby-throated, the inner primaries are more drastically tapered in width and are subtly notched along the inner web. This notching is I believe least apparent on immature females. The above bird shows tapered width to the tips of the inner primaries and very subtle notching (a light ‘kink’ before the tapering along the top edge. Note also the tip of P10 sticking out (the last feather tip to the wing). This tip appears narrow and sharp, another tick in favour of Ruby-throated. Figure 2: Here, in my opinion, some critical features to the wing stand out in this excellent photo. On the outer (left) wing, note how narrow P10 is (appears?). 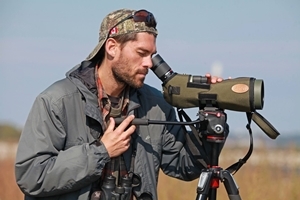 We can trace the entire curvature of the tip and see that it is quite narrow, which fits Ruby-throated vs. the palpably broad tip to P10 in Broad-winged. Another ‘tick’ for Ruby-throated. 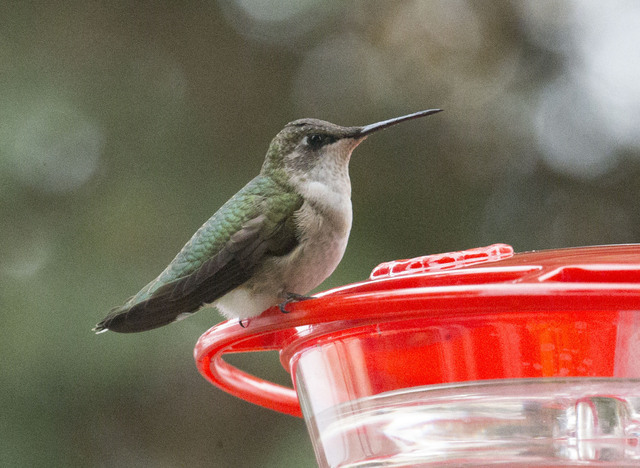 Preliminary identification: Immature female Ruby-throated Hummingbird. Disclaimer: I am not an expert on Archilochus ID so please augment these notes with other birders’ notes, esp. 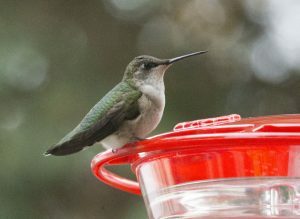 experts in the field of hummingbird ID! Acknowledgements: Thank you to Jeff Skevington for opening this identification query up to the general birding community and thanks, Jeff, for allowing use of your photos. Looking forward to the final outcome on this one!